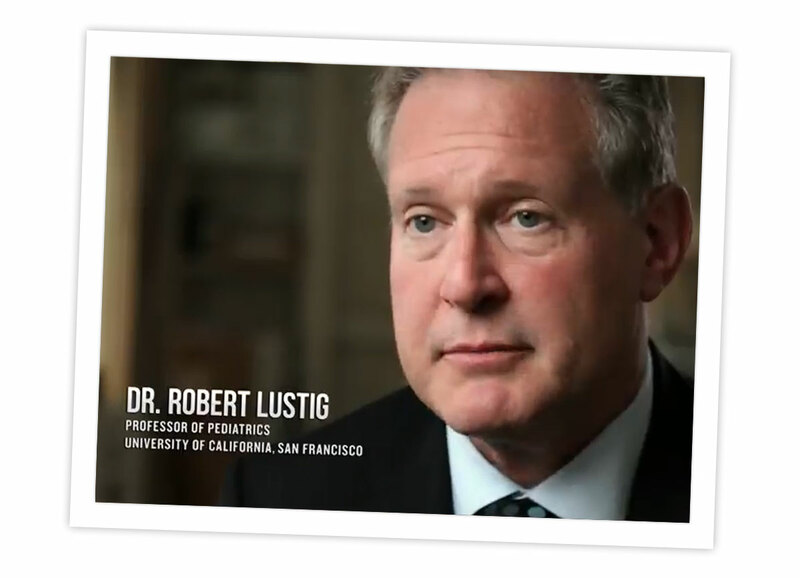 Globally, hundreds of millions have been exposed to the work of Dr. Robert Lustig. We also keep a list of research and academic papers here and Op-Eds here. View Dr. Lustig’s YouTube Channel / Playlists here. View the YouTube interviews of Dr. Lustig focusing on his new book, The Hacking of the American Mind. Que Pasa: Tecnologia & Ciencia (in Spanish), Sin azucar, por favor by Francisco Aravena F.
2011 COAST/UCOP Symposium on UCTV, July 19, Sugar Highs and Lows: How to Have a Sweet Ending – Interventions to Reduce Sugar Consumption, with Dr. Robert Lustig, View the PowerPoint presentation here. Why our food is making us fat by Jacques Peretti. The Guardian (UK), June 11, 2012. ABC News Good Morning America, April 4, 2012, Sugar Regulated as a “Controlled Substance”? NPR with Ira Flatow on Science Friday, February 17, 2012, Should Sugar be Regulated like Alcohol? New York Daily News, February 3, 2012, Should sugar be taxed like tobacco and alcohol? Listen to Rob on Radio New Zealand talking about Sugar, August 2013. The Truth About Sugar by Doug Fabrizio, RadioWest | Likuer, August 13, 2013. An article and radio interview. Toxic Sugar? Rob on Catalyst ABC Television in Australia, August 8, 2013. “Sugar Love (A not so sweet story)” in National Geographic by Rich Cohen. It’s the story of sugar. ‘Sugar is Poison‘ – All In With Chris HayesM A spot on the new documentary, FedUp. Dr. Lustig on Kron4 speaking about what you can do to reduce your sugar intake and promoting his new cookbook – The Fat Chance Cookbook. In Defense of Food the film, Too Much Sugar segment by Michael Pollan, PBS, December 30, 2015. This Junk-Food-Funded Elementary School Curriculum is Bonkers by Julia Lurie, Mother Jones, December 2, 2015. How Sweet It Is with Dr. Robert Lustig podcast by Eating Matters on Heritage Radio Network, November 19, 2015. FDA Says Americans Should Cut Added Sugar by Marisa Taylor, Al Jazeera America, November 12, 2015. Less Sugar May Mean Better Insulin Sensitivity in Obese Children by Parker Brown, Medpage Today, November 9, 2015. Cutting Sugar Improves Kids’ Health in 10 Days by Dr. Sanjay Gupta, CNN, November 7, 2015. Here’s a Diet That Actually Works, and Has the Science to Prove It by Tom Philpott, Mother Jones, November 2, 2015. Sugar Officially Worse For You Than Fat, Says Science by Caithlin Pena, Your Tango, November 5, 2015. Here’s Why Cutting Sugar Intake Is Sweet For Your Child’s Health by Katrina Pascual, Tech Times, October 30, 2015. Dramatic Effect Of Limiting Sugar For 9 Days, New Zealand Herald, October 29, 2015. Food Companies Should Stop Fighting The Obvious: Sugar Is Ruining Our Health by Robert Lustig, Washington Post, October 29, 2015. Cutting Sugar From Kids’ Diets Appears To Have A Beneficial Effect In Just 10 Days by Ariana Eunjung Cha, Washington Post, October 28, 2015. Restricting Sugar, Not Calories, Found To Improve Youths’ Health by Victoria Colliver, San Francisco Chronicle, October 27, 2015. Sugar Is Definitely Toxic, A New Study Says by Alice Park, Time, October 27, 2015. These Kids Stopped Eating Added Sugar And Then They Got Healthier by Anna Almendrala, Huffington Post, October 27, 2015. Sugar Isn’t Just Empty, Fattening Calories –It’s Making Us Sick by Robert Lustig, The Conversation, October 27, 2015. Removing Sugar From Diet For Just Nine Days Can Have ‘Dramatic Results,’ New Study Claims by Rose Troup Buchanan, Independent, October 27, 2015. Cutting Sugar ‘Can Improve Health In Nine Days’ by Laura Donnelly, Telegraph, October 27, 2015. Cutting Sugar For 9 Days Made Kids Look Healthier: Study by Maggie Fox, NBC News, October 27, 2015. Health Threat Of Sugar Is Vastly Underestimated, Study Claims by Sarah Boseley, Guardian, October 27, 2015. Study Links Sugar To Conditions That Lead To Diabetes, Heart Disease In Children by Betsey McKay and Mike Esterl, Wall Street Journal, October 27, 2015. No Doubt Sugar Is Toxic, Linked To Metabolic Syndrome by Rihanna John, Gracious Column, October 27, 2015. McGraw Cancer Awareness Symposium Focuses On Processed Food by Sam Wildow, Troy Daily News, October 27, 2015. Obese Children’s Health Rapidly Improves After Reducing Sugar In Small Study by News Staff, Science 2.0, October 27, 2015. What Happens When Sugary Foods Are Cut by Betsey McKay and Mike Esterl, MSN, October 27, 2015. Cutting Sugar Boosts Kids’ Health Immediately by Dennis Thompson, WebMD, October 27, 2015. Is Cutting Sugar A Quick Fix For Children’s Health? by Dennis Thompson, CBS News, October 27, 2015. The Science Is In: The Case For A Sugar Tax Is Overwhelming by Robert Lustig, Guardian, October 27, 2015. Obese Children’s Health Rapidly Improves With Sugar Reduction Unrelated To Calories by Juliana Bunim, UCSF News, October 27, 2015. Frequently Asked Questions about Isocaloric Fructose Restriction And Metabolic Improvement In Children With Obesity And Metabolic Syndrome by Robert Lustig, Institute for Responsible Nutrition, October 27, 2015. UNC Draws Flak For Naming Children’s Clinic After Donut Maker by Parker Brown, Medpage Today, October 20, 2015. 19 Ways To Give Up Sugar by Rodale Wellness Blog, Huffington Post, October 16, 2015. You Asked: Should I Count Calories? by Markham Heid, time.com, October 14, 2015. 9 Big Fat Lies You Believe About Fat by Elizabeth Narins, cosmopolitan.com, October 5, 2015. Is This The Real Reason We Are Obese? Doctor Says Australians Have Been Duped Into Overdosing On The ‘Dangerous’ And ‘Toxic’ Food That Is Sugar Because They Are Trying To Eat Low GI by Emily Crane, Daily Mail Australia, September 3, 2015. Processed Food: An Experiment That Failed, 2015 EAT Food Forum, June 2, 2015. FDA Censures Kind: A Look At Sugar And Fat Use In The “Health” Food Industry by Austin Cross, 89.3 KPCC, April 15, 2015. How Worried Should We Be About Sugar? Part 3 of the TED Radio Hour episode The Food We Eat, November 17, 2016. How to Stop Sugar From Sneaking Into Your Child’s Diet by Lisa Drayer, CNN, November 2, 2016. How to Break the Junk Food Habit by Alec Rosenberg, University of California Newsroom, October 31, 2016. Grocers Are Caught in the Middle of Soda Wars by Stephen Stock, Robert Campos, Jeremy Carroll and Felipe Escamilla, NBC Bay Area, October 31, 2016. In the Fight Against Obesity, the Real Enemy is Oversimplification by Tamar Haspel, Undark, October 13, 2016. Are Health Groups Helping to Fuel the Obesity Epidemic? by Alexandria Bachert, MedPage Today, October 10, 2016. AAP: Focus on Healthy Lifestyle, Not Weight, in Adolescents by Alexandria Bachert, MedPage Today, August 23, 2016. Kids and Added Sugars: How Much is Too Much? American Heart Association News, August 22, 2016. Cutting Down On Sweets Can Help Kids’ Hearts by Mary Elizabeth Dallas, HealthDay News, July 19, 2016. Cutting Sugar Rapidly Improves Heart Health Markers by Rachel Rabkin Peachman, NY Times Well Blog, July 19, 2016. Short-term Isocaloric Fructose Restriction Lowers ApoC-III Levels and Yields Less Atherogenic Lipoprotein Profiles in Children with Obesity and Metabolic Syndrome, by Alejandro Gugliucci, Robert Lustig, et al, Atherosclerosis, July 19, 2016. You Asked: Do Sugar Substitutes Causes Type 2 Diabetes? by Markham Heid, Time, July 6, 2016. Fat and Sugar, Part 2, Ideas with Paul Kennedy, CBC Radio, June 22, 2016. Sugar and Public Health, UK Parliamentary Office of Science and Technology, June 20, 2016. ‘Bad’ Cholesterol May Have a Bad Rap by Brian Krans, Healthline, June 17, 2016. Fat and Sugar, Part 1, Ideas with Paul Kennedy, CBC Radio, June 15, 2016. Britain’s Diabetes Crisis Blamed On Low-Fat Diet Craze by Giles Sheldrick and Olivia Lerche, Espress, May 23, 2016. The New Food Label: Hardly Perfect But Decidedly Better by Robert Lustig, IRN blog, May 23, 2016. How To Get A Sugar Detox Without The Pain by Peta Bee, Irish Examiner, May 20, 2016. New Nutrition Label Could Help Americans Curb Their Sugar Habit by Tara Duggan, SF Chronicle, May 20, 2016. How The War On Sugar Could Affect Coke and Pepsi’s Bottom Lines by Maggie McGrath, Forbes, May 17, 2016. Parents Worried About Kellogg’s Adding Peanut Flour To Popular Cracker Brands by Julie Watts, CBS SF Bay Area, May 17, 2016. Pie In The Sky, But Soft Drinks Is Running Out Of Choices by Olly Wehring, just-drinks.com, May 17, 2016. UCSF Expert: ‘No Data’ For Claims That Juice Drinks Help Body Absorb Nutrients Quicker by Allen Martin, CBS SF Bay Area, May 9, 2016. You Asked: What’s The Healthiest Weekday Breakfast by Markham Heid, Time, May 11, 2016. Here’s What Happens To Your Body When You Go 10 Days Without Sugar by Alanna Ketler, Collective Evolution, May 8, 2016. Buffett Made Five Mistakes In Laughing Off The Coca-Cola Question by Michael Shapinker, Financial Times, May 4, 2016. 56 Names For Sugar The Food Industry Uses To Hide How Much Is In Their Products by Jeanette Wang, South China Morning Post, April 25, 2016. 6 Hidden Truths About Sugar, and How It’s Making Us Ill by Jeanette Wang, South China Morning Post, April 25, 2016. AIC 2016 Panel: Eating Dangerously – Why Should You Be Worried About Consuming Fat and Sugar by Credit Suisse, April 12, 2016. One In Three of World’s Adults With Diabetes Is In China, WHO Reports by Jeanette Wang, South China Morning Post, April 7, 2016. Low Sugar, High Fiber Add Longevity blog by Credit Suisse, April 7, 2016. Dr. Robert Lustig – Fat Chance interview by Noreen Mir, RTHK Hong Kong, April 6, 2016. Processed Food: Long-term Pain for Short-Term Gain by Keith Micallef, Times of Malta, April 4, 2016. Sugar: Killing You Sweetly by Claire Caruana, Times of Malta, March 27, 2016. Robert Lustig: Godfather of the Sugar Tax by Izabella Kaminska, Financial Times, March 18, 2016. We Don’t Mean to Ruin Smoothies, But… by Tom Philpott, Mother Jones, March 16, 2016. Sweet and Sour interview by Beth Saulnier, Cornell Alumni Magazine, March/April 2016. Sugar: The Newest and Bitterest Truth presentation by Dr. Robert Lustig at UC Berkeley Haas Dean’s Speaker Series, February 29, 2016. Nutritionists Offer Ways to Get the Sugar Monkey Off Your Back by John F. Gilmore III, Pittsburgh Post-Gazette, February 16, 2016. Sugar-Is That the Culprit of Our Aches, Pains, and Weight Issues? Interview with Ronn Owens, KGO810, February 4, 2016. Americans Say They Are Trying To Cut Sugar Intake by Chris Prentice, Reuters, February 2, 2016. Obesity Scientist Says Modern Diet Needs Less Sugar; Rep. David Jolly Ditches Personal Fundraising audiocast by Rob Lorei, 88.5 WMNF Radio, January 21, 2016. Changing Your Diet, For Life by Geoffrey Riley and Emily Cureton, Jefferson Public Radio, January 20, 2016. Experts Say Lobbying Skewed the U.S. Dietary Guidelines by Markham Heid, Time, January 8, 2016. New Government Dietary Guidelines Recommend Limiting Added Sugars by Tiffany Wilson, ABC7News, January 7, 2016. Here’s What 10 Experts Think of the Government’s New Diet Advice by Alexandra Sifferlin, Time, January 7, 2016. Game-Changers 2015: Rethinking Fat by Roger Sergel, Medpage Today, January 4, 2016. The cholesterol and calorie hypothesis are both dead — it is time to focus on the real culprit: insulin resistance. Clinical Pharmacist. 14 July 14, 2017. By Maryanne Demasi, Robert H Lustig, and Aseem Malhotra. Robert Lustig, a leader of the global “anti-sugar” movement, lays bare the ravages of a high-sugar diet. Business Times. June 10, 2017. Unsweetened truths, Robert Lustig, a leader of the global “anti-sugar” movement, lays bare the ravages of a high-sugar diet. Business Times. June 10, 2017. One-month sugar detox: A nutritionist explains how and why. CNN. June 9, 2017. This Survey Can Tell If You’re Addicted to Your Phone. Mens Health. June 1, 2017. This popular product is deadly for health. The Mice Times of Asia, May 11, 2017. There’s A War On Sugar. Is It Justified? Freakonomics. April 27, 2017. Drink Your Whole Milk, Eat Your Butter … Or Don’t: The Great Fat Debate. April 7, 2017. This Is What Happens to Your Body When You Eat Sugar. Uh-oh. That treat comes with some not-so-sweet side effects. Health.Com. March 22, 2017. A sugar expert reveals 3 popular foods with a disgusting amount of hidden sugar. Business Insider. March 15, 2017. Processed Food, the Experiment that Failed. JAMA Pediatrics. March 17, 2017. Children who eat too much sugar are developing diseases that only alcoholics used to get. Business Insider. March 24, 2017. A sugar expert explains the unhealthy downside of smoothies. Business Insider. March 21, 2017. What happens to your body and brain when you eat too much sugar. Business Insider. March 22, 2017. The disturbing amount of soda we drink today compared to 100 years ago. Business Insider. April 5, 2017. How orange juice fell from grace. Desert News. February 21, 2017. Processed food: an experiment that failed. JAMA Pediatrics 171:212-214, 2017. Letter to the Editor response, doi:10.1001/jamapediatrics.2017.1906, July 17, 2017. Secrets for successful aging, from one who is ageless. Marin Public Health Letter (in press). Perspective on Markova et al., “Protein-rich diet can help manage type 2 diabetes, NAFLD”. Clinical Endocrinology News, doi: 10.1053/j.gastro.2016.10.007), Jan 3, 2017. Perspective on Tey et al., “Effects of aspartame-, monk fruit-, stevia- and sucrose-sweetened beverages on postprandial glucose, insulin and energy intake. Practice Update January 27, 2017. Stigler FL, Lustig RH, Ma JI: Letter to the Editor — in response to Heymsfield SB and Wadden TA, “Mechanisms, pathophysiology, and management of obesity”. N Engl J Med 376:1490, 2017. Demasi M, Lustig RH, Malhotra A: The cholesterol and calorie hypotheses are dead — it’s time to focus on the real culprit, insulin resistance. Clinical Pharmacist, Vol 9, No 8, doi: 10.1211/CP.2017.20203046, July 14, 2017. Stigler FL, Lustig RH, Moser AM: Letter to the Editor — in response to Villareal DT et al., “Aerobic or resistance exercise, or both, in dieting obese older adults“. N Engl J Med 377:598, 2017. Perspective on Ward ZJ et al. “Simulation of growth trajectories of childhood obesity into adulthood“. N Engl J Med 377:2145-2153, 2017. Does technology addiction exist? YES. (NO by C Ferguson). Point-Counterpoint feature, Congressional Quarterly Researcher, April 20, 2018. Malhotra A, Schofield G, Lustig RH: In tackling the obesity/diabetes crises, the science against sugar alone is not sufficient — opposition from vested interests must also be overcome. Pharm J (April 19).